What Are My Fat Reduction Options? Home/Blog/What Are My Fat Reduction Options? Getting rid of unwanted fat has long been a concern of patients considering plastic surgery. The good news is that there are now several new options available to patients looking to address this issue. 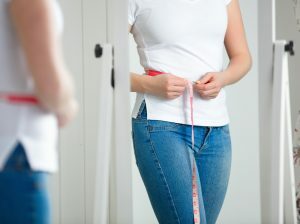 These include invasive procedures, such as liposuction, and non-invasive procedures such as injections or fat freezing. The bad news, however, is that none of these fat reduction techniques are a substitute for a healthy diet, exercise, and weight loss. The best candidates for any of these fat reduction techniques remain those patients with an ideal body weight who continue to have fat deposits that are not responsive to dieting and increased exercise. Liposuction is a minimally invasive operation that requires a small surgical incision through which a tube is inserted and used to suction out excess fat. It remains the gold standard to which all other fat removal procedures are compared. Liposuction is accomplished by inserting a narrow hollow metal tube into an area of excess fat, sometimes in conjunction with an energy device such as a laser (Smartlipo®) or ultrasound (VASERlipo®). The procedure is done in an operating room under either local or general anesthesia. Post-operatively, patients may have some pain that requires pain medicine and often will have some drainage that requires changing bandages. Stitches are typically used and are removed five days after surgery. All patients need to wear compression garments after surgery for up to six weeks to help them achieve the best results. Non-invasive procedures to remove excess fat may include injectables. Mesotherapy, a form of injections, has been used for many years, particularly outside the United States; however, it is not approved by the FDA, the treatments are not standardized, and there is no scientific data validating its use. There is a new injectable, KYBELLA (deoxycholic acid), that is FDA approved and has been shown to be clinically effective to diminish fat in the chin area. Deoxycholic acid is a naturally occurring molecule in the body that helps break down fat. KYBELLA is a synthetic form of this molecule that can be injected to reduce fullness under the chin. Treatment involves several injections in the area to be treated, and most patients require several sessions spaced over several months to achieve optimal results. Although not particularly painful, some patients will require pain medicine after the procedure and may experience bruising and swelling that can last for up to two weeks. The newest form of non-invasive fat removal is a fat freezing technique called CoolSculpting. This is a technology that uses a process called cryolipolysis to target and remove fat cells. By selectively hyper-cooling areas of excess fat, fat cells are injured and begin a process called fat cell apoptosis. No changes occur to the surrounding nerves or other tissues because they are much more resistant to cold than fat cells. The fat cells that are injured subsequently die and are removed by natural body processes using macrophages and phagocytosis over a period of weeks and months. CoolSculpting treatment involves applying a specialized applicator to a given area for approximately 30 minutes. Multiple areas can be addressed at a single setting. Treatments are typically associated with minimal discomfort and patients do not require pain medicine. While documented fat reduction can be seen after a single treatment, it is recommended that patients have at least two treatments, usually separated by several weeks, to achieve the best results. In the best cases, CoolSculpting can achieve liposuction-like results in a safe, comfortable setting with essentially no downtime or recovery period. CoolSculpting works best in those patients who would be good candidates for liposuction; however, it may also be used in certain select patients who are not good candidates for liposuction. Although liposuction remains the most effective treatment for fat removal, these newly available non-invasive procedures can provide additional options to patients that either do not want to undergo surgery or who are not good candidates for liposuction. If you are curious about fat reduction and want to find out more about the option that may be right for you, we welcome you to contact Weston Plastic Surgery to schedule a complimentary consultation with Dr. Rothfield.